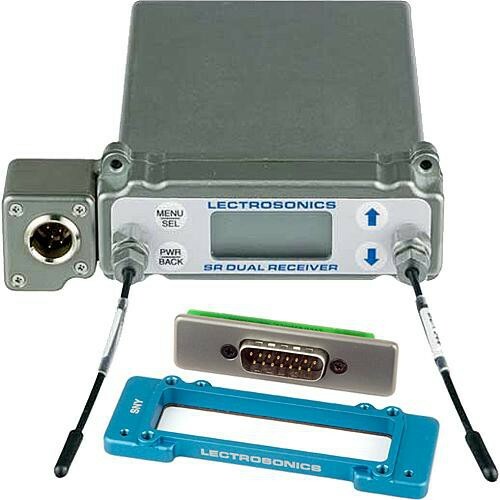 The Lectrosonics SRb5P Dual-Channel Slot Mount ENG Receiver Kit from B&H is designed to install in the wireless receiver slots found on professional video cameras, and includes the Lectrosonics SRSNY adapter kit for complete compatibility with the slots and inputs found on Sony cameras. The receiver itself features two independent digital hybrid wireless UHF receivers in a single lightweight body. The SRb5P provides an additional audio output next to the front panel for use with cameras that have only one audio input in the mounting slot. One channel can feed the connector in the camera slot, and the second channel can be connected to the external audio jack on the camera with a cable. An optional accessory enables you to power the SRb5P Receiver with L and M type rechargeable batteries. With a pair of Lectrosonics transmitters, the SRb5P makes for a formidable wireless solution for the discerning production professional who needs to reliably capture broadcast ready audio. You can easily remove the antennas when storing, or replace them with right-angle antennas when necessary. The SRb5P features two of Lectrosonics acclaimed Digital Hybrid receivers which deliver compandor-free crystal clear audio. The SRb5P Receiver features a simplistic 4 membrane-switch interface with an LCD display. You can scan for open frequencies and carry out all of the commands with a few button pushes. Mounting Options Mounts in video camera receiver slots, or on a camera shoe with the SRSLEEVE and SRHARDWARE accessories.